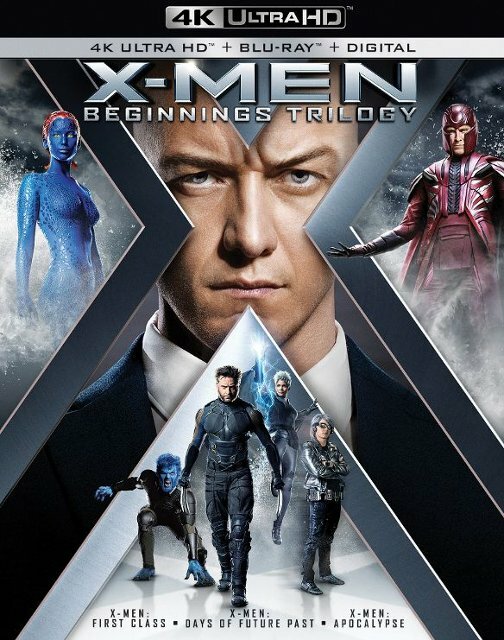 On the last Tuesday of this month the X-Men Beginnings Trilogy will release to Ultra HD Blu-ray Disc, bringing X-Men: First Class (2011), X-Men: Days of Future Past (2014) and X-Men: Apocalypse (2016) to 4k resolution all in one package. The single films have already been released to 4k Blu-ray dating back to 2016, but considering this trilogy is priced only 36.99 at Best Buy it seems to be the more practical way to upgrade all three titles to 4k. What’s more, the trilogy comes in a combo pack with Blu-ray and Digital Copies of each film, presumably with codes for 4k digital versions where available. Don’t confuse this X-Men three-movie edition with the X-Men Trilogy released to 4k Blu-ray last September. The edition packaged X-Men (2000), X2: X-Men United (2003) and X-Men: The Last Stand (2006) also in a combo edition with Blu-ray and Digital Copies. Amazon customers in the US be warned. As of this article’s publish date they are only selling the Region B/2 edition of X-Men Beginnings Trilogy on Ultra HD Blu-ray that won’t play on 4k Blu-ray players sold in North America. We’ll keep you posted on the availability of a Region A/1 disc edition. Update: The X-Men Beginnings Trilogy is available on Amazon for $29.99 in a bundled format made in Mexico. However, the cover art looks different from what we posted above from Best Buy. You can check out the Amazon bundle here.